Time and temperature signs were the first electronic message centers, and are probably the most photographed signs in America. During last summer's heatwave, or that unseasonal cold snap in March, the workhorse of the sign industry was there to validate extreme temperatures as news outlets filmed those below zero lows and three-digit highs. Passersby took note and shared sign images on social media with witty captions about the crazy weather. At sixty-five, time and temperature signs still have the power to attract attention. In the beginning, there was time (really) or there was temperature. But not both. Until we changed all that. The first time and temperature sign that displayed both time and temperature with the same bank of bulbs shipped out of our Danville factory in December of 1951. From that day forward, our work shaped the look of many Main Street landscapes, and the proud tradition continues today. The story of the Watchfire (then Time-O-Matic) time and temp began with light bulbs and mechanical time-keeping and evolved to the FlipOmatic low wattage flippers, which offered an energy savings up up to 93% over bulb models. By 1998 we introduced LED technology, and then made a good thing even better by encapsulating modules rather than covering them with Lexan. Innovating along the way, we have a spent over sixty-five years supplying the most specified time and temperature signs in the industry. Today our time and temperature LED signs are as hardy as ever and can still turn a business into a landmark. They feature the same patented front-ventilation and 5" slim cabinet design as our LED message centers and deliver excellent viewing at close to medium ranges. Built on a 19mm module platform, 12 inch, and 24 character heights are available in either red or amber. Our TimeTracker® System is satellite-guided to provide precision time accurate to the trillionth of a second. 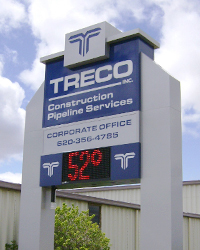 Digital temperature sensing gives your sign’s temperature display increased reliability and accuracy. Like our entire line of LED products, our time and temperature signs are FCC compliant, UL 48 & CUL 48 listed and UL Energy Efficiency Certified, and average energy use equals about 1/3 of the maximum amperage requirement. Fully encapsulated modules provide high durability and weather resistance, and through-hole LED construction is proven to maximize image clarity and lengthen LED life.